Backfired? I don't suppose he expected that to happen to him, eh! 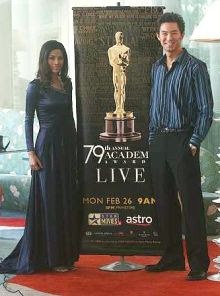 Today's Malay Mail shed further light on Linda's non appeareance at the Red Carpet event in LA. One cannot help believing that behind all the excuses, the primary reason was due to her realisation that she was not good enough to conduct the interview in English. Rather than confirming it and embarrasing herself, she simply chickened out! Hmm, so now it has become a he said she said situation. Who to believe? I don't know whether Linda Onn is fluent in English or not. But she seems to me a very confident and poised person. I do not think that she would have accepted the offer to co-host the red carpet programme if she wasn't confident enough to do the job well. I don't know, maybe Mr Manager can shed further light on the subject, as an insider in the show biz business.